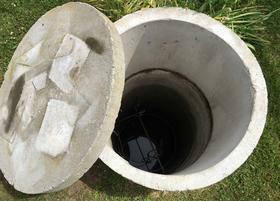 Ready Or Not: As Storms Become Stronger, What's In Store For Coastal Drinking Wells? 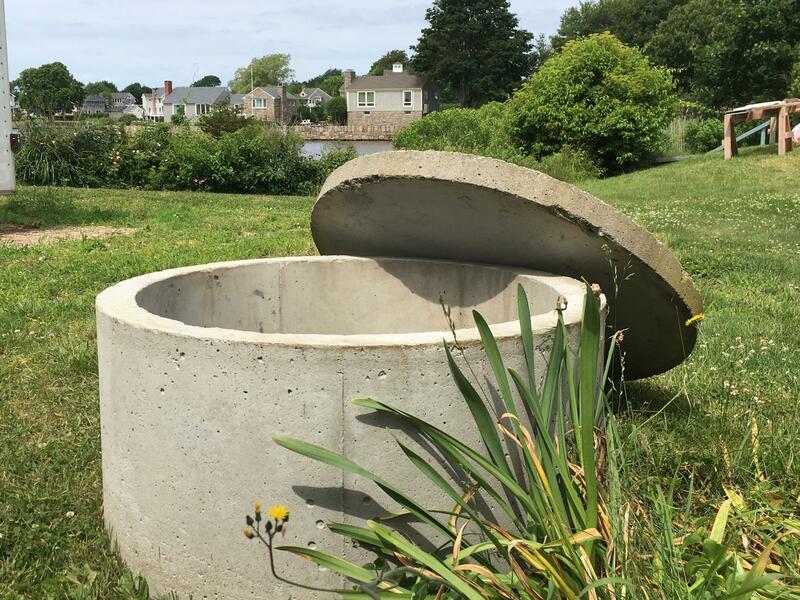 Wells are essential in Charlestown because the town has no water system, but will climate change threaten the quality of the water that comes from them? On a quiet street by Green Hill Pond in Charlestown about a mile away from the ocean, Andrew Baer walks onto his front lawn and asks for help sliding the cap off his well. Luckily, he's having solar panels installed and there are plenty of hands at-the-ready. Baer and his helper grip the cement cap and they drag it off a cement cylinder that's about 12 feet deep. Inside, there's water, of course, but unlike those pictures you may have seen in story books, it isn't scooped out with a pail and then hoisted up to the surface with a rope. Instead, there’s a pump inside that runs on electricity. "It pumps the water from that well into a pressure tank into our basement, it goes into a pressure tank and then comes up into our plumbing," Baer said. Charlestown has no water system, so the Baers rely on their well for drinking, bathing, doing dishes -- everything; and so far, Baer said that’s been working out for them. "We have no bacteria or chloroform or really any issues with our water and it tastes delicious," Baer said. However, scientists have been wondering how storm surge during major weather events, like hurricanes, could impact the quality of water that comes from those coastal wells. Will the water always be delicious or should thousands of coastal residents be concerned about the threat from stronger storms to come? What Is Groundwater And How Can It Get Contaminated? "It’s not an isolated, magic underground lake, none of that," Thomas Boving, geosciences professor at the University of Rhode Island, said when asked to define groundwater. Boving said groundwater isn’t just there. It comes from the rain, and when it rains, that water seeps into the ground and gets trapped. That trapped water, Boving said, is freshwater and typically very safe to drink, but it can get contaminated if there are too many chemicals on the surface. Or even too much salt. "People have reported that they have had instances where they had salt, salty water in their well water immediately after these storm events," Soni Pradhanang, a geosciences professor at the University of Rhode Island who studies water quality, said. After Superstorm Sandy in 2012, several coastal wells in Charlestown were salted, and salted water isn’t like the added bonus of having salt on your pretzel. It can cause health problems, like high blood pressure and heart attacks, just like a high-sodium diet. Too much salt in your well makes it unusable, and this can happen even if you're far from the ocean. Pradhanang said in New York, storm surge during Hurricane Irene in 2011 was so strong that even wells miles inland were contaminated with salt. "The effect was seen in upstate close to Albany, which is pretty far, like almost 100 miles or more from the Hudson River," Pradhanang said. 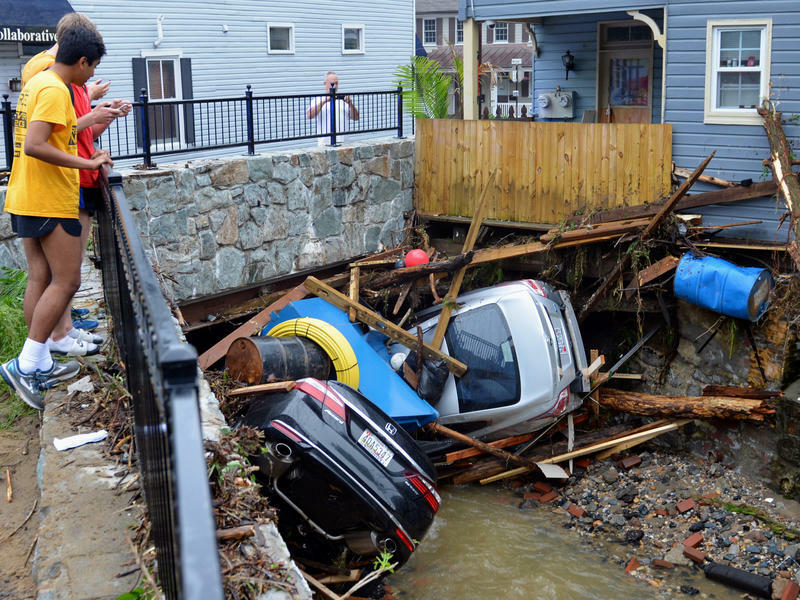 In Charlestown, there is no plan for protecting wells in a big storm because you can’t physically prevent saltwater from seeping into the ground. When a storm causes a lot of flooding, residents are required to provide the town with well-water samples to make sure it's still drinkable. If it's not, they just have to drink bottled water until they can use their wells again. Just like rain, freshwater from ponds and other inland bodies is always seeping through the land. However, if too much saltwater mixes in with it during a really strong storm, like a hurricane, Boving said the salt can start moving underground too. "If a freshwater system gets replaced by a saltwater system, then that same water, that salt water, will now, instead of the freshwater, recharge the groundwater, bringing in the salt, causing a problem," Boving said. That problem could become more common as climate change causes stronger storms. 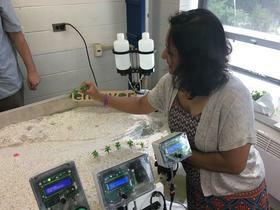 Boving and Pradhanang are working on a study to map out the potential impacts a big storm could have on coastal wells so residents, like the Baers, can be aware of their risks. Boving said scientists aren’t far enough into their research yet to know how severe the effects could be. 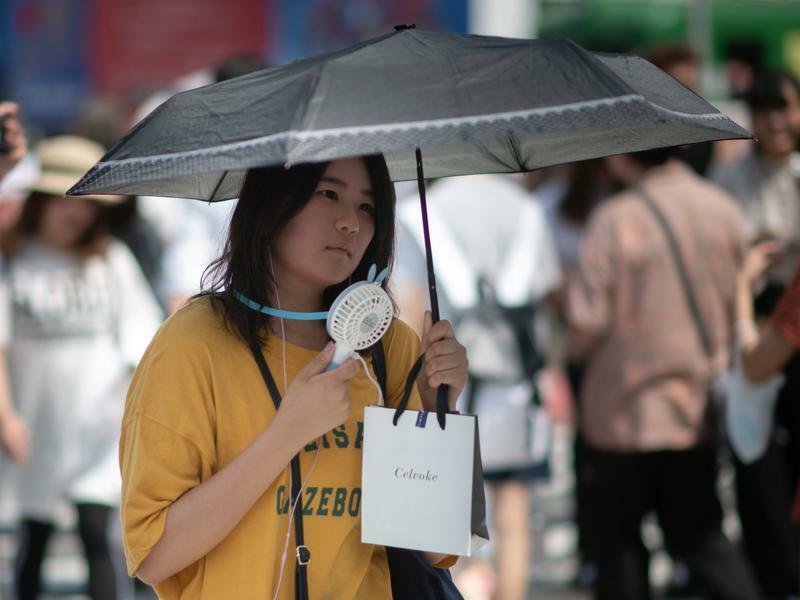 "But it’s very likely that if it happens today, many people would be hurting because of their well being salted," Boving said. Once the wells are contaminated, they can desalinate naturally, but it could take months before the water is fresh enough to drink again; and other alternatives for desalinating cost too much money. An even bigger concern for Baer is rising sea levels, which could permanently salt his well. "We can kind of live with a catastrophic event and anticipate it’s going to get better, but if it becomes sort of the chronic repercussions of climate change and sea level rise, there’s definitely going to be a big problem with our freshwater," Baer said. Freshwater floats on top of saltwater because it’s less dense, and if sea levels rise, the saltwater underground does too, pushing more salt into wells and making it harder to access enough freshwater. Charlestown Town Council President Virginia Lee said the town doesn’t have a plan to prevent wells from becoming permanently salted because homeowners are responsible for the quality of their own well water. "And the state, the Department of Health, doesn’t regulate private wells only public wells. So people are on their own," Lee said. Baer knows of a street nearby where people can’t use their wells and rely regularly on trucks to bring them their water. It’s not clear whether climate change is the cause of that, but it gives Baer an idea of how he might have to live one day if rising sea levels salt his well. He wants to see a more proactive approach to addressing the issue. "We know we’re in deep (expletive). Let’s put it that way, right? So we don’t need more studies to figure that out," Baer said. Town officials said they’re aware of the problem and they’re concerned about it. They said they do their part to raise awareness about how residents can keep the groundwater as clean as possible, such as offering programs for safe landscaping practices, and they recommend homeowners have their wells tested each year to make sure the water is still safe to drink. Copyright 2018 Rhode Island Public Radio. To see more, visit Rhode Island Public Radio.